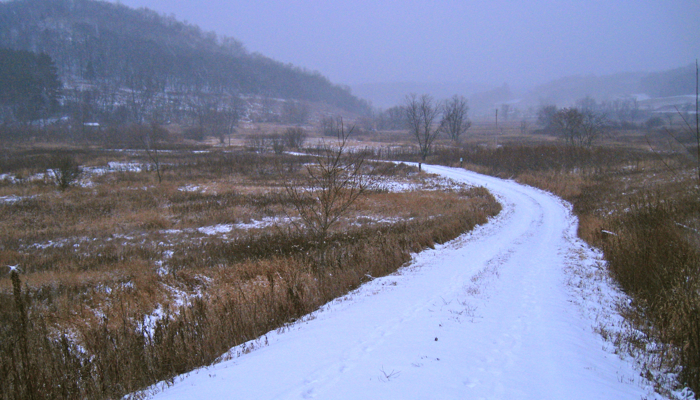 It’s much colder this week, and we finally had a big snowstorm – the first really good one in a few years. 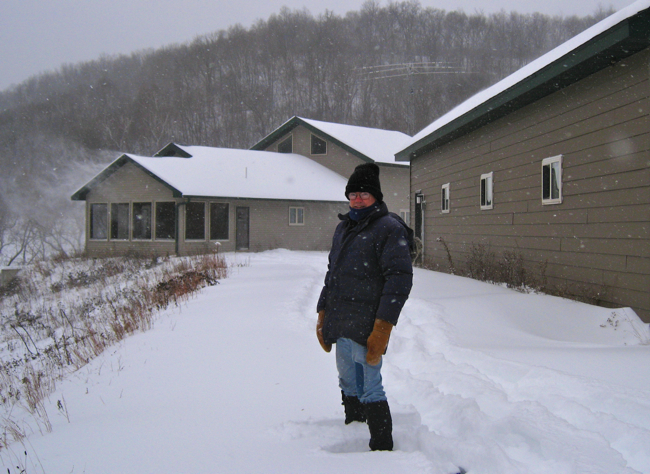 Mike has been so anxious to use his big snowblower – on the tractor – to plow out the driveway, and we finally had enough snow! 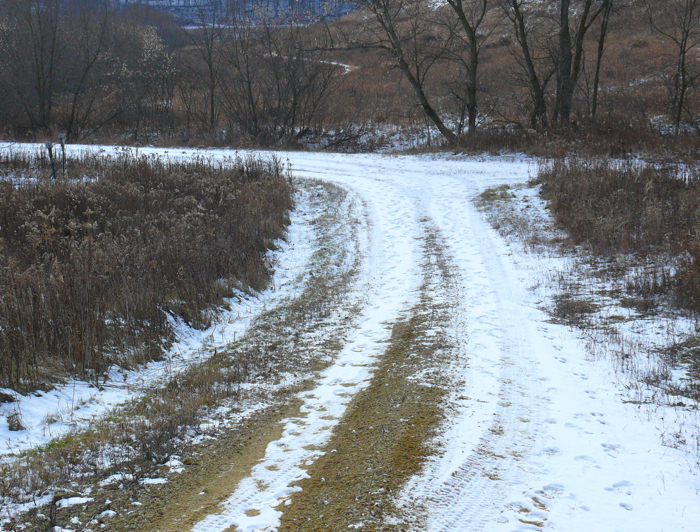 Then the snow came – here’s the beginning – the driveway is just a little whiter. 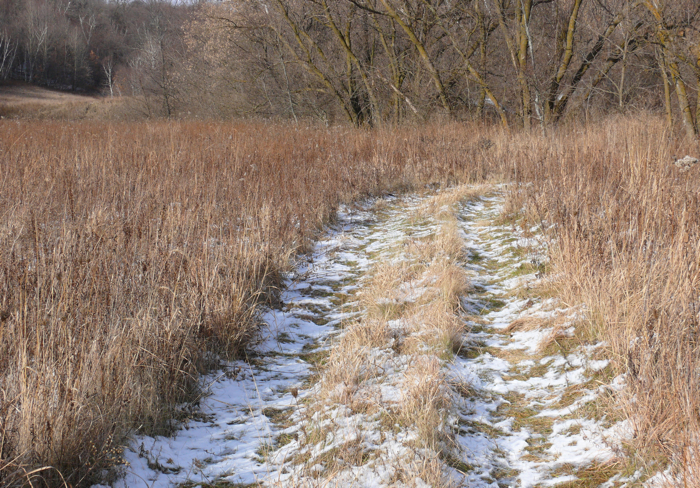 Then, in the morning, we had to do our walk on snowshoes. 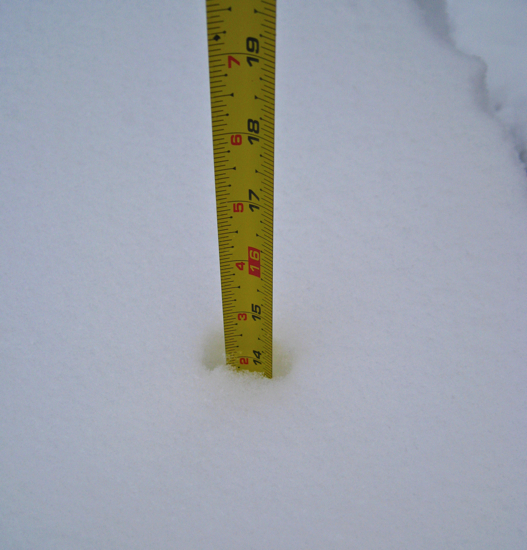 We got 14 inches overnight. And then Mike got to do the driveway. We took some video – from both inside and outside the tractor – and Mike put together a video of the experience. 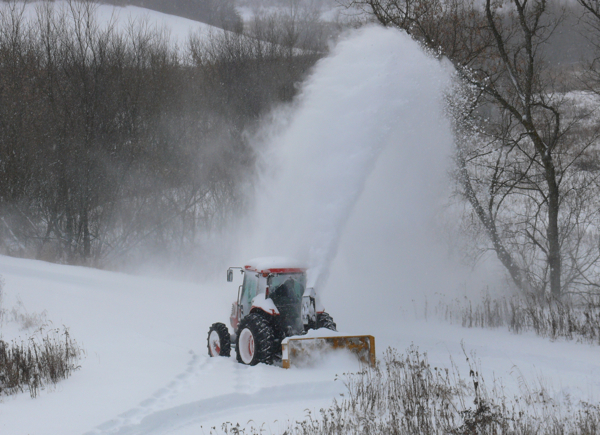 Blowing out big snows is one of his favorite things, and he doesn’t get to do it very often. 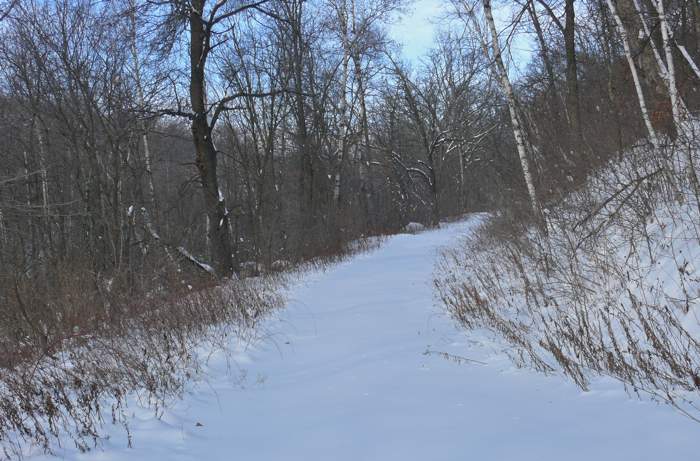 All our trails are snow covered now – we’ll have to snowshoe them until spring. 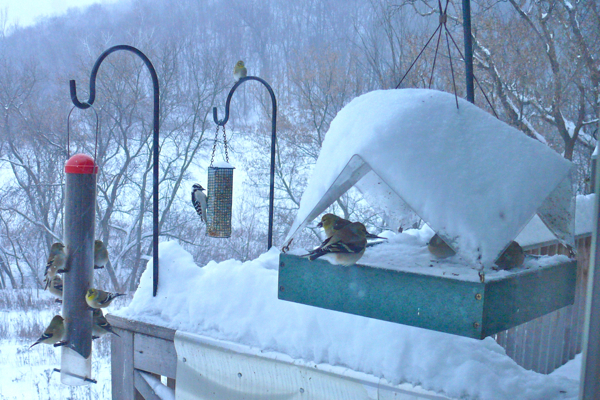 On snowy days the birds crowd onto the feeders and I have to fill them several times a day. Sometimes in the late afternoons I see a flock of Bluebirds fluttering into and around one of our bluebird nest boxes. They’re looking for a place to spend the night. They all go in together, and all those bodies keep each other warm during the cold night. Usually they use holes in trees, which have thick wood insulation. 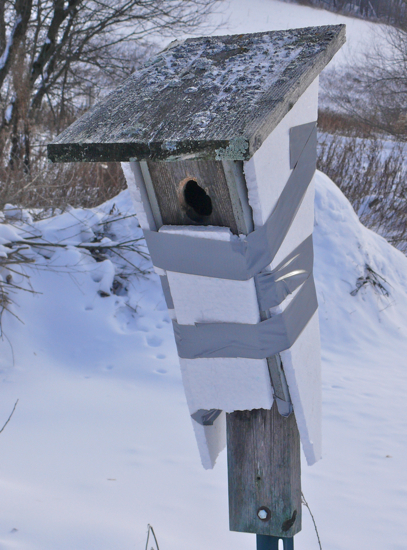 The thin sides of next boxes don’t provide nearly as much insulation; so to protect the birds, people are advised to open their boxes for the winter so the birds won’t be tempted to use them. I decided to insulate one of our boxes so the birds can use it and still be safe. It looks a little silly, but it should keep them warm. Last week – December 4th – Lake Pepin was completely ice free; by this week – December 11th – it was completely frozen over. It’s amazing that it can happen that fast. We only saw one in-between stage. The day after the big snow – December 9th – the bottom end of the lake was frozen, but the upper part still had big areas of open water. 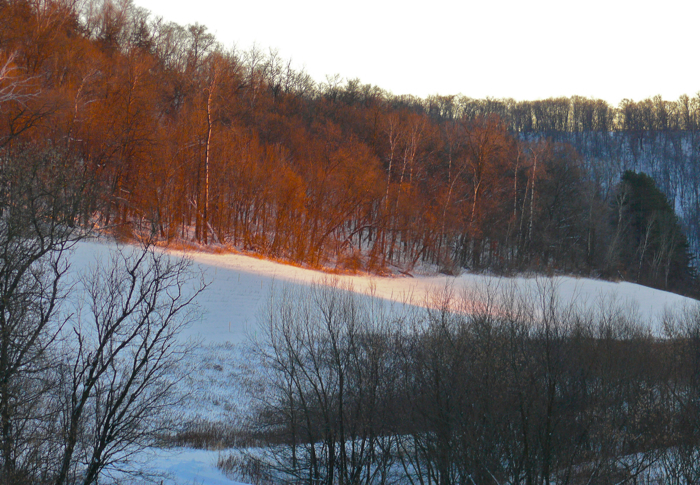 The sun is very far north these days, so in the afternoons the sunset barely touches the far end of the valley.